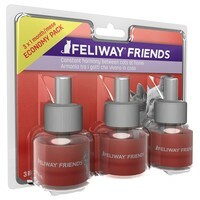 The Feliway Friends Refill Economy Pack contains 3 refills for use with the Feliway Friends Diffuser 30 Day Starter Kit. Feliway Friends is a synthetic copy of the cat appeasing pheromone (CAP) which is produced naturally by the mother after giving birth, and helps reduce or prevent conflict and tension between household cats. Used in the home, Feliway Friends helps create a harmonious environment where your cats can feel safe, and has been shown to reduce signs of conflict and aggression between housemate cats. Please Note: In the event the 3 pack is unavailable, VetUK will send you 3 x 1 Packs at no additional cost.